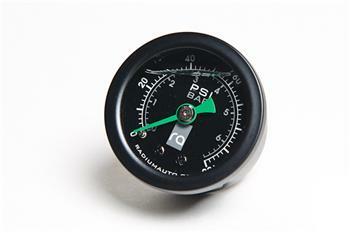 This high-accuracy fuel pressure gauge is suitable for all fueling applications. It features an acrylic lens with a silicone filled dial that reads from 0 to 100psi (0 to 6.9 BAR) with +/- 2% accuracy. Silicone fluid prevents the needle from vibrating for easy pressure readings. The internal bubble is normal. Rugged stainless 1-5/8” OD steel case (1-3/4” OD bezel) with nickel plated male 1/8” NPT fitting. Available with black bezel and housing only.